More and more adolescents are eating a plant-based diet. Here’s what RDs should know when counseling these impressionable, health-conscious kids. Nicholas Western, a 16-year-old from Fairfax, Virginia, made the switch to a vegetarian diet a little more than two years ago and says he hasn’t looked back. As the only vegetarian in his family, he says adapting to this change and finding meat-free food in the house sometimes can be a challenge, but he wants to remain a vegetarian for the long haul. “As long as I get the necessary nutrients, which I do by taking multivitamins and drinking protein shakes, I believe this diet is sustainable,” Western says. Western is part of a growing trend of teenage vegetarians who seem to be leading the way to a more healthful manner of eating in their age group. Going vegetarian is nothing new for America’s youths, but there does seem to be increasing interest among young people in adopting a plant-based diet. A 2010 poll by the advocacy organization The Vegetarian Resource Group found that 9% of girls aged 13 to 15 claimed to be vegetarian. The reasons youngsters are making this change also have shifted over the years. There’s no question that today’s teens have more access to information and media outlets than the younger generations of years past, which may be contributing to more of them choosing to forgo meat. For Western, it was an article published by the Sierra Club regarding the carbon footprint of meat that caused him to think about making the switch. He says the books Fast Food Nation: The Dark Side of the All-American Meal and Chew on This: Everything You Don’t Want to Know About Fast Food influenced his decision as well. While making a switch to a vegetarian diet can be an incredibly healthful decision if done correctly, there’s some fear that teens may be missing nutrients vital to their development. With a vegetarian or vegan diet (where individuals also give up animal products, including dairy and eggs), the biggest concern is that teens won’t get the calcium, vitamin D, vitamin B12, and iron they need. Teens can obtain these nutrients in a vegetarian or vegan diet, but it requires some planning. That’s certainly worth addressing as most people automatically equate vegetarianism with eating a diet primarily consisting of vegetables. However, some teens may be eating more pizza and French fries than they are greens—and that’s an issue. Another concern is that vegetarian teens tend to be more prone to eating disorders. 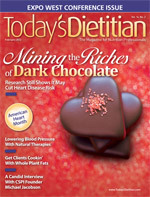 The research on vegetarianism and eating disorders is limited, but a study published in the April 2009 issue of the Journal of the American Dietetic Association showed that teens may experiment with vegetarianism as a way to mask an eating disorder since it’s a socially acceptable way of saying no to food in public. The study suggests that many of the adolescents who reported switching to a plant-based diet had reasons that were more focused on losing weight than helping the environment, saving animals, or eating healthfully. While the research showed that the vegetarians were healthier—they consumed less than 30% of their calories from fat—it also found that approximately 20% of them were binge eaters compared with only 5% of the omnivores. Similarly, 25% of the vegetarians aged 15 to 18 and 20% of the former vegetarian group studied (same age range) admitted to using extreme weight-loss measures such as forced vomiting or taking laxatives.